A traditional pairing for luncheon with friend of the blog, Greg, and a Basque dinner with Mrs. E. . I included this photo after yesterday’s DB shot to show what proportion can do for you. I’m wearing a navy Hackett suit coat that is cut a little closer and shorter than the DB, Leviner Wood custom shirt, Tie Bar knit tie, custom Martegani monk straps and (super light) Incotex trousers that are cut a lot narrower than any others I own, all of which (I think) makes me look a bit thinner and taller. I should have taken the shot of me with my hands cupped beneath the skirt of the coat, the traditional method of checking that the length is correct. It would have shown that the coat is “too short”. The effect on my silhouette is to make my 5’8″ frame a bit taller by “showing more leg”, for lack of a better term. Is the coat too short? No, it covers the seat of my trousers. How slim is the trouser? It is a flat front and measures about 7″ at the ankle, which is pretty slim. The final test is how the trouser sits on my shoe. I wear a US size 8.5 (about an 8UK), and the trouser, with a very slight break covers about 1/3 of the monk strap, making my foot a bit longer and slimmer (which I like), without making me look like I’m wearing drainpipe trousers and clown shoes. At the moment, this is my favourite silhouette, as much as I admire the cuts of the past, this sleeker look is more becoming to my frame. That doesn’t mean that I’m squeezed into the clothing. Fred Astaire favoured the Scholte cut, which is very drapey, yet he never swam in his suits. In the end, it’s what works for you — cut, colour, proportion. 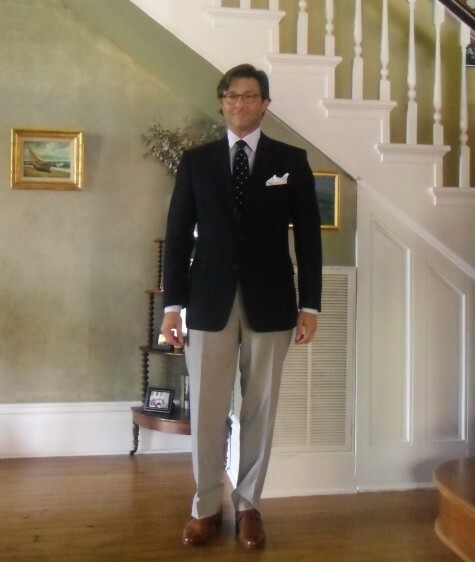 This entry was posted in Elegantology, Uncategorized and tagged Basque food, Fred Astaire, Hackett, Incotex, Leviner-Wood, Martegani, monk straps, Scholte, Suit Proportion, The Tie Bar. Bookmark the permalink. Glad to see you endorsing a slimmer fit! I’ve been reading your blog for a while, and always felt it better suited your frame. After a post like this, I really must upgrade my wardrobe. Aesthete!!!!!! What a pleasure to hear from you. Haven’t been reading — many apologies and look forward to your latest and always greatests. While shopping with my sons, the sales person educated us on the slimmer cuts, the narrower ties and the higher price. The economy dictates fashion. We are all looking for ways to tighten the belt and to show our “svelte” selves. Chris you look great! The summer has been very kind to you (what is you secret). Although I love the traditional cut of men’s clothing from the 1930’s, I don’t think it works on everyone. Comparing the two pictures, on the latest you look 15 – 20 pounds slimmer, and a couple of inches taller. Slim cut and comfortable clothing is the way to go! Thank you all. Interestingly, I’ve had a comment from a newsletter subscriber saying that she thinks the jacket is far too small looking on me. It is all a matter of taste. I would prefer a bit more skirt to the jacket, but it fits fine and I do feel that it slims me down. Raulston, I have a good tailor….. I’m actually 25+ lbs heavier than I was last year, but working to rectify that in ways other than sartorial. That’s a great-looking outfit on you. Hadn’t noticed the weight gain you mentioned but I do like the slightly longer hair, as well. Bravo! This is terrific. Agree with everything you’re saying (and everything we’re seeing). Tailored and trim without looking squeezed. It works; I never would’ve figured you for 5-8, nor for wearing an 8.5 shoe (you’re the same height and shoe size as me, but I unfortunately don’t have your physique). Johnny, thanks. Getting the hang of proportion is tough. Especially when the RTW and fashion gang is always monkeying around with it. Flusser is the source of all knowledge and after that, experimentation and some Hollywood movie study.